...I would say I'm surprised about this, but the truth is that I'm not. When it comes to YouTube after all, if you say you're not going to do something - as I did - and then you give an option to the fans - as I did - you all will take the opportunity to watch me suffer. But here's the truth: I think any sort of conversation surrounding Post Malone that I'm having now is very different that if I had reviewed his debut record several months back, because his position has evolved with regards to popular culture. He's not entirely the guy that seems tailor-made by record executives to capitalize on mumble rap with a white artist, but instead more of a character who can accept jokes and criticism with good humor and shows up on a podcast with h3h3productions. It's led to a bit of a weird situation, and something I've noticed with a lot of white rappers: they either try to go hard with real hip-hop credibility, or they look to cash in with dumb party rap that's so disposable that the punchline for this guy's career has already been written. And while there is a part of me that feels it's a little twisted and wrong and says a lot about hip-hop audiences that black artists making more lyrical or interesting music - or even other mumble rappers - have been ignored in favor of someone appropriating that style that they can relate to because they're often white, I'm also very much aware that Post Malone has a shelf life. Frankly, I'm surprised he's had as much success into this year as he has, especially with 'Congratulations' being a top ten hit. All of that being said, while the cultural apparatus and impact of Post Malone is kind of fascinating, his music isn't. To put it bluntly, while 'White Iverson' is terrible and deserves its spot on my worst hits of 2016, what makes it more exasperating is how boring and lifeless it felt, combining the worthless tedium of a Jack Johnson song with the shallow monotony of most mumble rap, and let's be real: 'Congratulations' is not much better. In short there was a very real reason why I didn't want to cover Stoney... but you all insisted, so now, beating all other possible options by a nearly a two-to-one ratio, I'm reviewing this: so what did we get? Well, I got pretty much exactly what I expected - and pretty much what you'll all expect too. Hell, it's not like when I covered Paramore's self-titled album where I had an extended history with the band to be explained along with my ambivalence, or how Isaiah Rashad and Børns' albums were respectively great and solid, which tended to match the critical consensus. 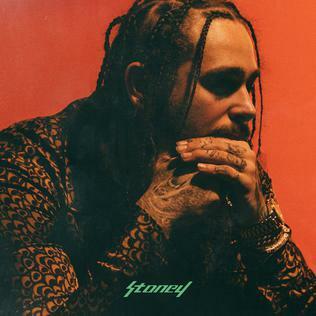 This... look, it's not like Post Malone is an artist with unexplored dimensions or complexity - his success has been reliant on a very easy-going, smoky, bass-heavy vibe, and while there are moments on Stoney where it's almost tolerable, it's still fifty minutes of Post Malone's nasal braying, sloppy wordplay, and dreary personality - and that's providing the production actually comes together! Yeah, there's no way around this: I've got issues with Post Malone as a rapper that we'll get to in a second, but I have much bigger issues with him as a singer. A song like 'I Fall Apart' expects him to pull off his best vibrato Weeknd impression against Illangelo's production and sound impassioned and soulful... and look, I don't buy it, not for a second, every moment he tries to strain for emotion he sounds like he's passing a kidney stone. And that's when he's trying: more often than not this record falls into dreary, autotune soaked moaning that barely stays on key, has little actual diction, and just sounds like Post Malone could hardly care about what he's rapping or singing about - which here is less impressive and more lazy. Justin Bieber might be something of an inert presence on 'Deja Vu' but he at least sounds engaged, and Kehlani at least gets the subtle presence and emotional intensity of these sorts of grooves that can pull you in, a level of control that Post Malone just can't bring to the table. What becomes more of an issue is when you consider the content and overall mood of these songs, and that ties into lyrics. Now I don't have many complimentary things to say about Future... pretty much ever, but when he's most tolerable for me is when he can match his dark, smoldering beats and grooves with the angry nihilism that ran through a lot of his writing - even at his most hedonistic and assholish, there was something potent in the wallow in bad taste. Post Malone doesn't remotely come close to that sort of lyrical cohesion, which isn't really notable when he's just rattling through interchangeable flexing bars, abusing drugs, and brand names, but when he starts going on about women in any capacity it starts to get really obnoxious. Again, I've already talked about 'Deja Vu' and how Bieber and Post Malone epically miss the point, but does he honestly think on a song like 'Cold' that all his jewelry flexing is going to be what this girl wants to hear in his incredibly needy verses, especially when he can't seem to decide if he wants her around at all? Or on 'I Fall Apart', the big breakup ballad where he's calling the girl 'devil in the form of a whore' where he's falling into a drunken mess and keeps referencing all the jewelry he bought her... if he's expecting me to feel sorry for him here, it's not coming through well at all, especially when he seems like on 'Go Flex' it seems inevitable that he's going to cheat on any girlfriend he might have! At least Kehlani seems to get it and manufacture a certain amount of clinical distance, just enjoy the physical experience and not expect anything more, but Post Malone doesn't seem to do that - which can make for quite the tonal dissonance when you have songs where he's running through brag rap followed by songs like 'Up There' where he's saying it's such hell on earth and his girl doesn't love him and he's trying to act like nothing fazes him, even on the next song and closing track he back to rattling off brand names and referencing 'White Iverson' again! What it highlights is the sort of insipid angst that I have limited patience for when Future or other mumble rappers deliver it, but without getting personal or political, Malone can't even get that deep. And that's it: that's what we get, a showcase of droning tedium that clearly shows some kind of angst but with no real problems to really whine about we get a tonally dissonant mess from a frontman who has even less to say than your average mumble rapper. Sure, there are a few beats that have some presence, but with languid tempos, no real sense of momentum beyond a few quick flows that feel utterly barren of interesting punchlines or character, it shows an artist who makes party music for spoiled rich L.A. brats who are too cool to engage with art beyond shallow flash, and a listening public who wants to be just like them. And as I think I grew out of that phase a good six or seven years ago, I have no use for this record whatsoever. 3/10, no recommendation, and with some luck, when I celebrate an anniversary next year, we'll get something better. how does Migos do for you? For their sophomore album, Migos pull out of similar territory to a mixed bag of results.